Medium ruby color. Fruity, medicinal, minty, herbal aromas of blackberry, black cherry, mint, and cola with a soft, dry medium-to-full body and a warming, interesting, medium-long , dark chocolate, and licorice finish with well-integrated tannins. A flavorful, rich Merlot with pleasant herbaceous tones. Bottom Line: A flavorful, rich Merlot with pleasant herbaceous tones. 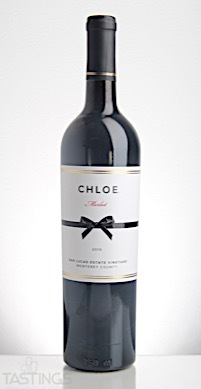 Chloe 2015 San Lucas Estate Vineyard, Merlot, Monterey County rating was calculated by tastings.com to be 93 points out of 100 on 7/21/2017. Please note that MSRP may have changed since the date of our review.